Touchscreens are great. They really are. But they still involve taking your eyes off the road, and that's never a good idea, not if you can avoid it. I decided the final step to making my Car PC project a success would be to add voice control. 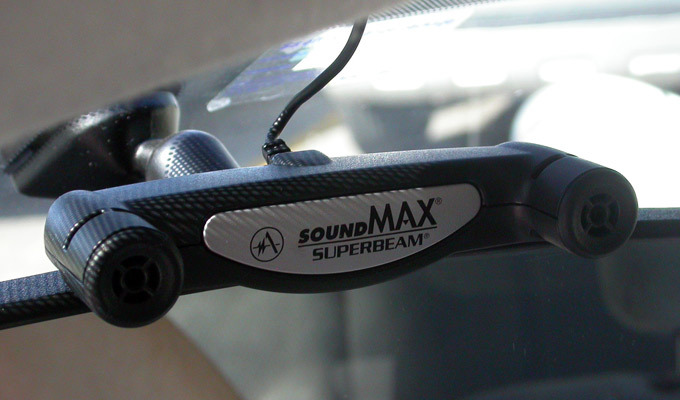 Some research led me to the Andrea SoundMax Superbeam stereo array microphone, which is excellent for voice recognition in high-noise environments. It even came with a USB adapter. Pressing this button pauses the music, plays a "listening" sound, and then mutes all other audio. The computer listens for a command, and confirms it once you've spoken. If you hit the button again before the confirmation is done, the command is cancelled. This system works amazingly well, even in high-noise environments. I've successfully issued commands while driving down the expressway with both windows down. The button connects into the rear, into this box. 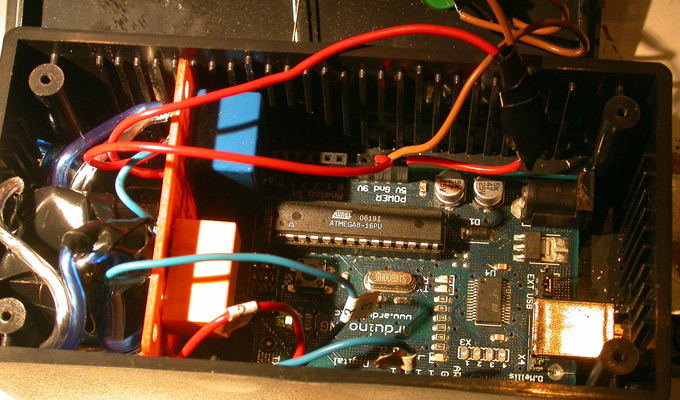 Inside, a series of relays and an Arduino USB-connected microcontroller handle the input and inform the computer that the button was pressed. The other relays inside control the LED sign and detect if the reverse gear is engaged for the reverse camera. Commands like Play, Pause, Next Track are easy. I've also got various search functions: "Music Search" lets you type in a search query, while "Song Search" lets me just speak the name of an artist. It works well for proper names like "The Proclaimers", but has trouble with stuff like "U2". There's also "Show Lyrics", etc. I can change to an XM channel by saying "Listen to 80's on 8", for example. It's easy to quickly send messages to the driver behind me without taking my eyes off the road, such as Thank You. A quick command lets me get the most recent traffic information verbally. iGuidance doesn't have an API, but I can still do basic operations like zooming in and out, clearing the current route, etc. The phone control is limited, but I can initiate a call using only my voice, via my phone's built-in voice dialing and my CarPC's phone integration (see next section).